In Close Encounters you'll discover who Jesus is by looking at the stories of five people who met him. Jesus had many close encounters with ordinary people, turning around their lives in totally unexpected ways. Close Encounters helps us discover for ourselves who Jesus is by looking at the stories of five people who met him. This straightforward, four-session course will bring the teaching of Jesus to a broad range of people, including those who normally have difficulty accessing the Christian message. Using the down-to-earth skills of two experienced Christian communicators - Pete Woodcock and Lizzy Smallwood - the DVD presentations explain and apply these stories of Jesus in a colourful and memorable way. This Starter Pack contains all you will need for running every session. You receive one DVD and three Handbooks. These resources will help you unpack some heart-warming true stories about Jesus, and introduce ordinary people to who Jesus is, why he came, and the difference he can make in our lives. This has proved really useful for us. Good clear presentation style; great to h ave a quiz to make sure we have read the passage; questions that really push to read what the verse says (and again, see what it says! ); good points of strong personal challenge, but sensibly offered for personal reflection not open discussion. I would like everyone in our home groups to go through these to learn to read what the passage says. A good pitch for unbelievers; fringe believers; wobbly Christians. One of our group likes it - they get lost in sermons or think of a question that they then forget by the end. This has lots of pauses - don't get lost and can ask the questions. Final testimonies lend 'real-life application'. Four weeks is an easy sell - not high commitment. 1. Sometimes the final section adds unnecessary complexity with new material. Running one a term as a follow-on from an invitation event. Run concurrently with our Sunday morning church (we've kicked the youth group out of the room into the vicarage!). Then people come to church - they've not done a course on a Monday night and then get asked to switch to another day - they meet the church over coffee afterwards and also means we can use church creche provision. We are pushed for time, but get lots from it. Considering running a fifth week on next term to review; to cover left over questions and watch a couple of testimonies that we missed through lack of time. 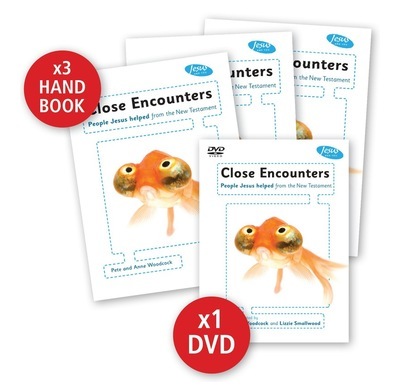 Purchased to kick-start a new afternoon home-group, Close Encounters is proving really helpful: there's no dumbing-down here! Fresh perspectives for mature Christians, with good questions for discussion, as well as being user-friendly and helpful for new disciples and seekers, mean that the materials are flexible for mixed ages and stages. Just a few comments about the presentation: it's a great idea to be able to choose presenters, it helps to ring the changes during a session. One of our members has hearing problems and the zooming in and out on faces is distracting when lip-reading (subtitles would be helpful). The fixed-camera means that sometimes the presenter's face is to one side of the screen - or even cut in half! I appreciate that the minimalist background focusses attention on what is being said, but it is a bit bare - especially when the presenter's face is to one side. A change of setting might be helpful. However, all-in-all, thumbs up to Close Encounters! I think we may need some extra handbooks and I'm sure we'll buy the other two courses. Many thanks to the Jesus and you production team. Any more planned? Only used half of the first session so far (! - meatier than expected), but found the questions excellent for provoking thought and discussion, even amongst mature Christians. This series is certainly not a 'soft option' but has been well researched. The opening summary of the passage highlighted fresh perspectives, helping us to see a familiar passage in a new light. Questions encouraged personal application of the teaching. The idea of being able to choose presenters is inspired as this could affect the way material is received - well worth all the extra production time this must have taken. Many thanks to Pete, Anne and TGBC! Although only seen session 1 (out of 4) so far, the course seems to be faithful yet well applied, and simple but vivid. Short videos interspersed with times of reflection on one Gospel passage, and thankfully the content is nowhere near as thick and fast as other more established evangelistic courses, making it ideal for seekers with low academic ability. For that reason alone, it's worth a try! I've so far only managed to use session 1 of this course, but it seems to be soundly evangelical, and superb for reaching folks with a low academic ability who are starting from zero knowledge of the gospel. Ignoring the annoying introduction (which you can skip) and various superfluous aspects of the presentation, what really sets it apart is how ideal it is for those with a slow reading speed / short attention span. The 3 videos per session are only about 5mins each, and the content is nowhere near as thick and fast as other more established evangelistic courses. The content is vivid yet unadorned, and interactive yet carefully applied. Worth a look, imho.